There are many great uses for our products. Arctic Warmers Wraps, Bags & Sleeves help you Start Warm & Stay Warm! Do you have another idea for uses for Arctic Warmer Warming Wraps or Bags? If we post it here we’ll send you a complimentary Inverter. The World’s Best Selling Caulk Warmer! Caulk Warmer® solves your cold weather application problems, keeping your productivity high and frustrations low. 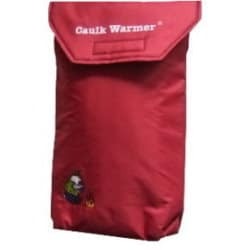 Patent Pending Technology: The Caulk Warmer®, combines a light weight economical heat source with a flexible patent pending heat reflecting shield system to retain heat in the bag and keep caulk and other temperature sensitive items warm. Work All Through The Winter: Caulk Warmer® bags will keep caulk at 80° even when the outside temperature drops to -13°. 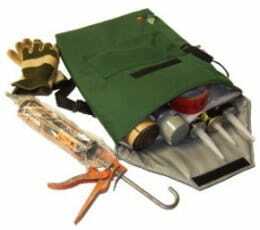 Built for The Construction Environment: The heavy duty nylon canvas bag has a backstrap with a “quick disconnect” for looping over railings, plugs into 120V AC or 12VDC inverter, requires only 50 watts of power, and has a convenient cord storage pouch on the front. There is a convenient on/off switch and the internal temperature is thermostatically controlled. Not Just For Caulk: The Caulk Warmer® holds 12 (1 case) standard size caulk tubes, or 7 quart size tubes, or 12 sausage size tubes, or 7 cans of foam, or 6 – 8 rolls of sealing tape, or 12 grease cartridges, or a case of floor tiles. 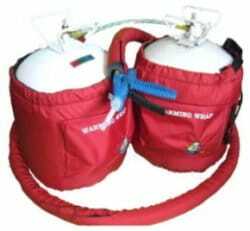 A Caulk Warming Bag can warm batteries or metal tools before use, and Caulk warmer Warming Wraps will also warm freon tanks! Working on a smaller project? Caulk Warmer Junior is all you need. With all the features of our regular Caulk Warming Bag, but using only 15 Watts of power and warming to a maximum temperature of 105 degrees, the Junior holds 4-5 standard size caulk tubes, 5 grease cartridges, 2 rolls of sealing tape or 2 cans of spray foam. Lower temperature Wraps (maximum heat 85 degrees) for 20# propane and spray foam cylinders. 25′ Spray Foam Hose Sleeve slides on easily with pull string. Hose Sleeve Extensions available with easy Velcro© Tab Attachment System – Gangable up to 150′. Arctic Warmers Warming Bags & Wraps cost much less to buy and operate than other warming methods on the market, providing a more economical source of keeping temperature sensitive products warm. 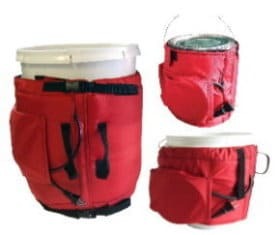 Light weight economical heat source and heat reflecting shield are encased in a heavy duty nylon canvas wrapper that wraps around the can or bucket, sealing tightly with Velcro©. Uses for the warmers vary from spray foams, adhesives, epoxies and elasto-meric sealers and coatings, to food industry items that need to be warmed or liquified before use. Boat builders, aircraft technicians and auto body repair shops will find the wraps to be especially useful for keeping epoxies and resins warm for better mixing and application. Concrete contractors will find the bag and wraps especially useful for keeping 2 part epoxies at optimal mixing temperature. This will ease the process of working on anchor insertion, expansion joints and also using injection ports to fill cracks. Work in the pest control industry? 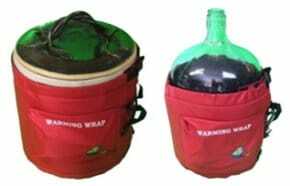 Arctic Warmers Warming Bags and Wraps will help you keep sealants and adhesives warm for cold weather application. Pests can be a problem all year round, so let us help you get the job done faster and easier. Care For Your Horse In Any Weather! 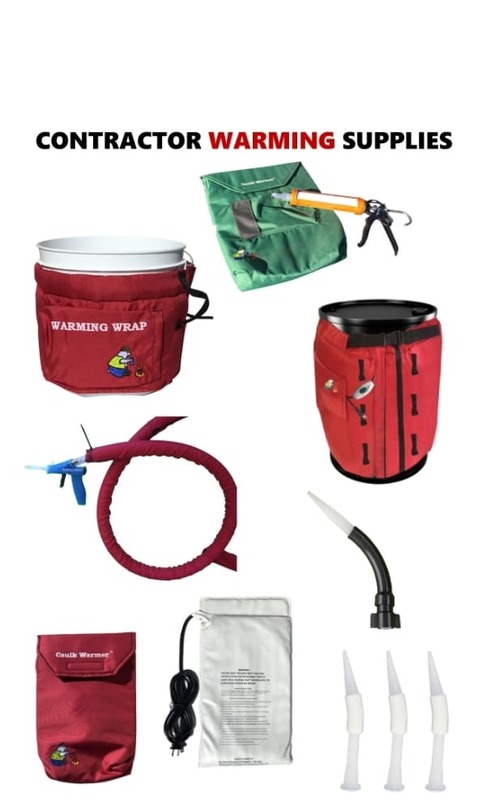 No Farriers kit would be complete without Caulk Warmer warming bags and wraps! 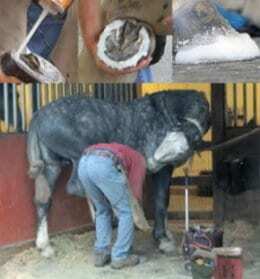 Keep hoof cement and other repair adhesive materials at optimum temperatures. Especially useful for stable and barn work during the cold weather seasons. Our Warming Wraps also make great wraps for fermenting products. You can keep a steady supply of warmth on your barrel, jug or bottle for even better home-brewing results when making homemade wines, beers and even Kombucha.